CD improvisation by these two British free improvisation players. 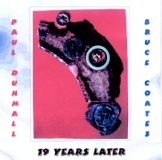 The nineteen years in the title is the length of time since the last time the players worked together (there’s a lovely picture inside of Paul Dunmall and our mate Bruce playing then — and Bruce was only 13!). This time they’ve chosen soprano saxes for the two pieces on the CD. High and pretty — great for those Steve Lacy and Lol Coxhill fans out there. £10 + p & p.
If you are interested, e-mail questions**experimentalmusic.co.uk (for the **, substitute @) for postage costs. Payment is made electronically by Paypal; please specify whether you would like a faster or slower delivery of your goods. Because of fluctuating exchange rates, do e-mail us for current prices in any other currency than UK sterling, although we do recommend sterling payments as the most economical way of paying.